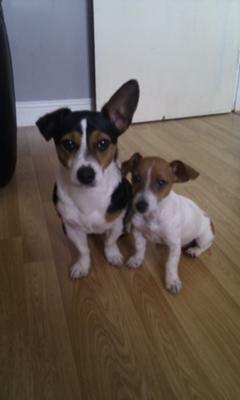 Alfie & Petal, My 2 Sweethearts! These are my 2 babies, Alfie and Petal. Alfie will be 2 next week and Petal is coming up to 5 months. After getting Alfie I realised how much work JRT's can be. But after a lot of time and dedication I have now turned him into THE PERFECT dog ! I thought long and hard about bringing another dog into our home. And with 2 children it was a very tough decision. I wondered if bringing in another was going to upset the balance I had created. In the end I decided on another JRT, but a female instead. She is a beautiful addition to the family and has learnt an awful lot in the short time she has been here. I must stress though- you do have to get training in ASAP. With Alfie I didn't and he was hard work! He would chew and obsess over things as simple as stones! A bit of hard work and regular activity is a must! I take my 2 twice a day on walks and they get a mile run twice a week! It's a good excuse to keep me fit aswell!! Comments for Alfie & Petal, My 2 Sweethearts! I agree with you 100 percent. These little guys are a lot of hard work, most people don't realize before getting. I too have had my fair share of trials and tribulations.....and I only have 1 JRT! I can't imagine having two. However, I wouldn't trade my Max for the world. He keeps me on my toes and to boot I have lost 5 pounds since getting him. Keep up the training. Your two look like good friends!